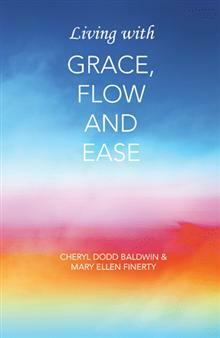 Authors Cheryl Dodd Baldwin and Mary Ellen Finerty teach us about invoking grace, flow and ease into our lives with their book, Living with Grace, Flow and Ease. Each chapter is a story told by one of the two authors, taking turns relating how their experiences as touch healers are enhanced with these three single-syllable words. Start by opening the heart and focusing on love, joy and gratitude. From this openness we can then feel a stillness that can be called prayer or meditation. Then refocus if necessary, and by the end of the day reflect on the moments or events in which you felt grace, flow and ease and give gratitude for them. Their stories demonstrate how Baldwin and Finerty were able to develop this concept and use it in their healing touch work with others—especially the children in Romania, where they have visited for several years as volunteers. This slim book is inspiring and authentic with real stories by dedicated women. For more information, visit GraceFlowAndEase.com. Living with Grace, Flow and Ease is available for purchase at Amazon.com. This entry was posted in DEPARTMENTS, Local Articles and tagged book, cheryl dodd baldwin, ellen sue spicer-jacobson, living with grace flow and ease, mary ellen finerty, the bookcase by Healthy Living Bucks and Montgomery Counties. Bookmark the permalink.